In a well-functioning greywater system, greywater soaks into the ground without pooling or running off. In general, clayey soils drain very slowly, while sandy or gravelly soils drain quickly. 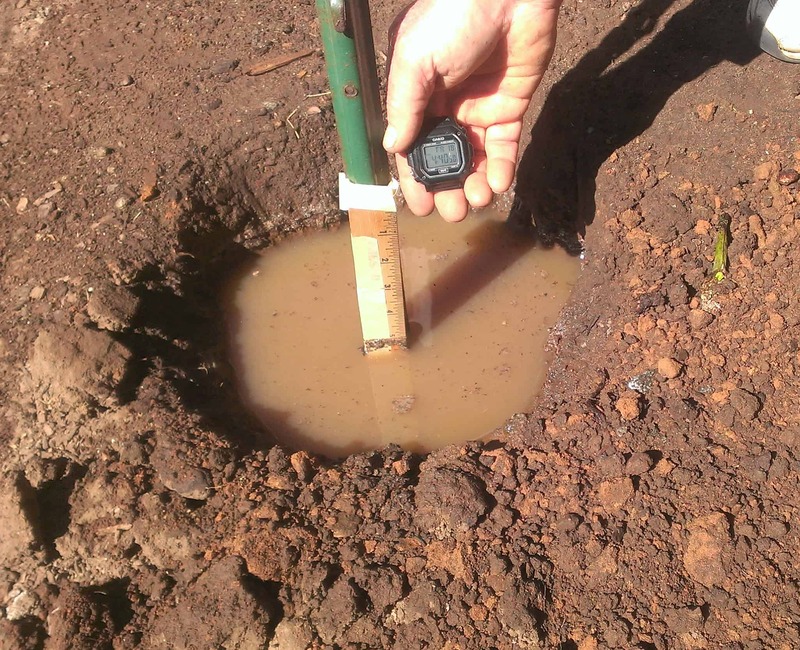 A home percolation test is a simple way to measure how quickly your soil drains and to determine how much area you need to infiltrate the greywater. Professional percolation tests, required for septic leach fields, are expensive, and unnecessary for a small greywater system. Many greywater codes use a soil type chart to predict drainage rates instead of percolation rate data. 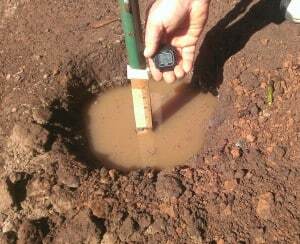 Greywater percolation tests should be conducted at the depth of discharge, ideally less than one foot. Step 1. Dig a 6″-12″ deep hole in your future greywater infiltration zone. Step 2. Place a ruler (or stick marked in inches) in the bottom of the hole. The measuring device should reach the top of the hole. Step 3. Fill the hole with water several times to saturate the soil. This may take several hours or overnight in clayey soils. Step 4. Note the time. Fill the hole with water. When the hole is empty, note the time and calculate the time needed to drain the hole. Step 6. Find your percolation rate on the chart below. Now we multiply our greywater flow (14 gallons per day) by the area needed (0.4). 14 X 0.4= 5.6, so we need about 6 square feet of ground to absorb our daily greywater flow. 46-60 1.0 If we were in this line we’d need 1.0 X 14 or 14 sq. feet. Using information from Chapter 16 in the California Plumbing Code. The California greywater code requires you to calculate infiltration area based on soil type rather than percolation rate. We think it’s more accurate to do a percolation test than to rely on soil type, but both give you important information. Regardless, if you used their chart and assumed you had very clayey soil, you’d need 1.1 square foot per gallon of greywater per day. So if you produced 14 gallons per day, you’d need 15.4 (round up to 16) square feet of infiltration area. If you have 4 trees, then you’ll need an area of 16/4, or 4 square foot per tree. Most mulch basins have around 12 sq. feet of disposal area, so there’s plenty of room.